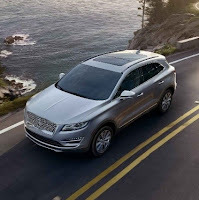 When you combine its excellent standard features, the 2019 Lincoln MKC Select delivers great value for the price. If want the MKC at its best, you'll want to get the Reserve version. It comes with many desirable extras such as a panoramic sunroof and a hands-free liftgate. It also gives you the option for the upgraded engine. Go with all-wheel drive option to get the adaptive suspension, which helps improve both the MKC's ride quality and handling. For 2019, new features like a newly designed grille that matches the ones on other Lincoln models and brings some continuity to the brand and gives the Select a classier look. Thanks to its quiet interior, the MKC is a comfortable place for long drives with plentiful features and composed ride. The Sync 3 infotainment system, which is easy to use and includes robust smartphone integration systems. The 2019 Lincoln MKC features four available trim levels. The base trim offers competitive technology features, while the Select trim adds more convenience features. The Reserve and Black Label increase the luxury through additional standard features and exclusive interior designs. The base engine is a turbocharged 2.0-liter four-cylinder engine combined with a six-speed automatic transmission and front-wheel drive. All-wheel drive is optional and comes bundled with adaptive suspension dampers. Also optional for the Reserve and the Black Label is a more powerful turbocharged 2.3-liter four-cylinder engine that produces 285 hp 305 lb-ft of torque. Once inside, cool technology features include the Sync 3 infotainment interface, an 8-inch touchscreen, Apple CarPlay and Android Auto, Bluetooth, Lincoln Connect with 4G LTE and a Wi-Fi hotspot, two USB ports, and a nine-speaker sound system with satellite radio. We suggest a trip to the Olympia Auto Mall and see all the new SUVs we have to offer, especially the 2019 Lincoln MKC Select. The helpful staff at Lincoln of Olympia would be happy to schedule a test drive and get you behind the wheel of this truly luxurious vehicle.